As a Certified Personal Trainer, I love seeing clients add sport supplements like branched amino acids or BCAA’s to their daily protocol. Nutritionist side of me loves how protein shakes are mainstream for anyone on the go. Over the years, trendy diets have come and go but health should always be the number one goal. Fruits and vegetables are essential for optimal health. Between contest prep goals, taste, texture, allergies, sensitivities and even the fiber causing constipation….I have heard literally millions of reasons why eating a mere 1/2 cup of berries or green beans daily is healthy menu planning. Not true! Luckily, NUTRAPHASE has hit the shelves! 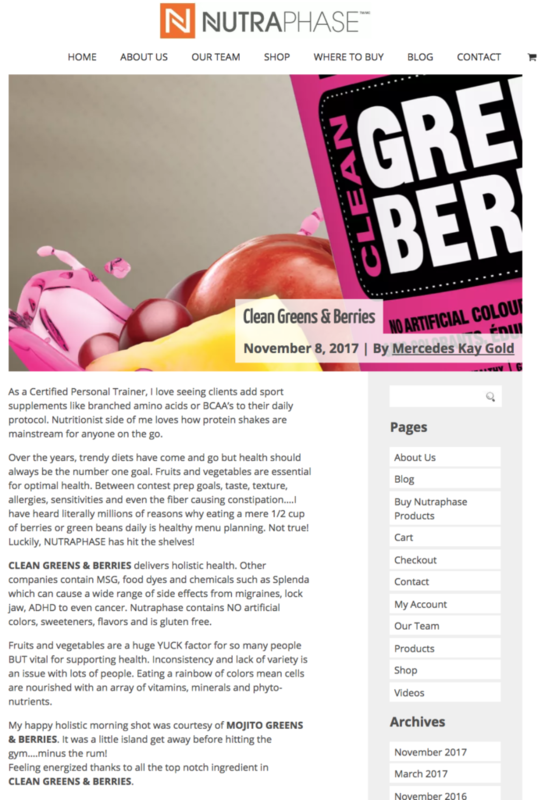 CLEAN GREENS & BERRIES delivers holistic health. Other companies contain MSG, food dyes and chemicals such as Splenda which can cause a wide range of side effects from migraines, lock jaw, ADHD to even cancer. Nutraphase contains NO artificial colors, sweeteners, flavors and is gluten free. Fruits and vegetables are a huge YUCK factor for so many people BUT vital for supporting health. Inconsistency and lack of variety is an issue with lots of people. Eating a rainbow of colors mean cells are nourished with an array of vitamins, minerals and phyto-nutrients. My happy holistic morning shot was courtesy of MOJITO GREENS & BERRIES. It was a little island get away before hitting the gym….minus the rum! Feeling energized thanks to all the top notch ingredient in GREENS & BERRIES. – Spirulina powder is a blue-green algae. It’s a prime source of chlorophyll, making it an ideal choice to combat bad breath from the inside out. Spirulina is a complete protein, containing stress relieving B vitamins. This single cell microorganism binds to toxins making it a gentle daily detox. – Spinach leaf gets its gorgeous green hue thanks to heart and eye protectors luetin and anthin. Also high in fat soluble vitamins A, E and K. Between the three, spinach helps prevent cardiovascular disease, certain cancers and even aids in blood clotting. – Parsley leaf is best known as a pesky plate garnish but is a busy bee holistic housekeeping throughout the body. Parsley leaf deserves xtra mention for its high vitamin C and iron content. – Apple pectin is a rich source of soluble fiber coming from the skin and pulp of the fruit. Studies show promise. It has lowered blood sugar and cholesterol levels among rats. For now, we do know increasing fiber in our diets aids digestion, elimination and promotes satiety. Apple fiber answers the call. – Alfalfa has been used for centuries in Traditional Chinese Medicine. Containing a wide range of vitamins and minerals, alfalfa aids digestion, helps lower cholesterol and is used for regulating blood sugar. Alfalfa contains mood lifting levels of vitamin D and B12. This super alkaline detoxing green grass adds to the powerhouse effect of NUTRAPHASE. – Chlorella is a gloriously green algae grown in fresh water. NUTRAPHASE chose the cracked cell wall powder form as its digestible. Chlorella is on my top 10 list of body supporting super foods. Chlorella contains protein, carbohydrates, fats, chlorophyll (responsible for its vivid green color) and various vitamins and minerals. – Bee pollen is a complete protein full of enzymes. Proponents of bee pollen believe it slows aging, boosts immunity and fights allergies. Weight loss and improved athletic endurance are an added bonus! – Acerola berry is a potent antioxidant containing lots of vitamin C and various B’s. It’s linked to managing blood sugar, regulating hormonal and metabolic processes and my favorite…..anti-aging. – American ginseng powder is a stress busting herb referred to as an adaptogen. It also gives the libido a natural lift! I am obsessed with the energy gained through ginseng! – Astragalus has been an integral part of traditional Chinese medicine for more than 2000 years, believing it balances “qi” or life force. Astragalus best known as an immune- supporting herb, helping increase cell activity. Say, “Good-bye sickness!”. – Grape seed extract is derived from the tiny red seeds of grapes, containing proanthocyanidins. They are believed to help prevent heart disease and cancer. Due to being oil and water soluble, grape seed extract can penetrate all types of cell membranes, fighting free radicals full force. Grape seed extract is connected to combating conditions linked to poor vascular function such as varicose veins, numbness and leg cramps. – Green tea extract is known for containing several types of catechins. This special group of flavanoids appears to offer protection from a variety of cancers. Noteworthy is a catechin referred to as EGCG (epigallocatechin gallate) that media has jumped all lover for good reason. It appears to lower blood pressure, aid in weight loss and anti-cancer. – Bilberry fruit extract is high in flavanoids therefore functioning as an antioxidant herb. It also contains anthocyanosides that support healthy eye function. – Carrot root powder is rich in vitamin A. Retinal is best known for supporting healthy vision. Vitamin A is also linked to increased white blood count, promoting cell growth. The carotenoid content in carrots is rumored to help prevent cervical cancer, diabetes and even help with weight loss! – Beet root powder is body boosting so NUTRAPHASE gave a double dose. FRUIT is holistic harmony. Vibrant colors, sweet flavor, fiber, vitamins and phyto-nutrients make fruit easy to love! From common fruits such as the apple to citrus to berries to melon and exotic fruits such as papaya, NUTRAPHASE has the rainbow covered. Vitamin C is a key component of fruits helping build strong immunity. Vitamin C is needed to support the adrenal glands. Every time our stress levels surge, vitamin C is depleted. Vitamin C is water soluble. We must continually meet the demand. When the supply is low, a cold may be on the horizon. Lots of vitamin C keeps the immune system strong! NUTRAPHASE uses various fruits to maximize benefits. Each eye-catching color equals unparalleled holistic health benefits. Working in synergy, supporting health by the scoop! – Pineapple fruit (powder) contains a digestive enzyme called bromelain. Vitamin C and A, calcium and other minerals such as selenium can be found. Pineapple is best known for manganese, a less known mineral but a favorite among those plagued with knee issues. – Apple fruit (powder) is a perfect powerhouse of vitamins and minerals. 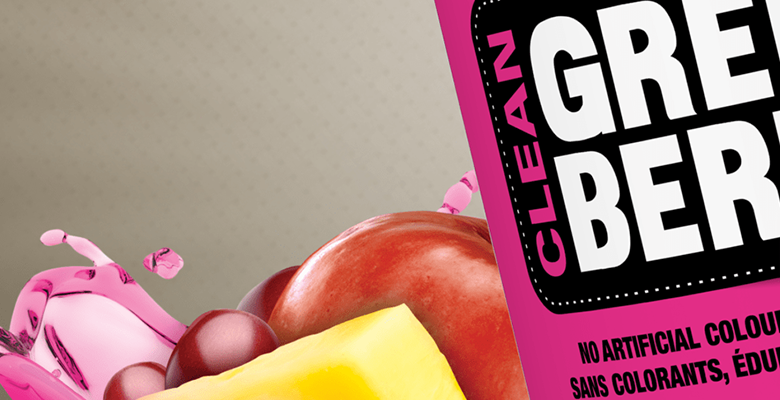 Whoever coined the term, “An apple a day keeps the doctor away!” was right on the money. – Acai freeze dried berry powder is antioxidant overload. Fighting free radical damage in the body, solving skin issues, brain boosting and weight loss aid. Along the Amazon River, acai berry was traditionally favored as an aphrodisiac and anti-aging remedy. – Strawberry powder supplies lots of vitamin C which is essential for healing connective tissue and supporting strong immunity. – Cranberry powder is chocked full of vitamin C. Cranberries are known for anthocyanidins, fancy name given for flavanoids. Cranberries are a great antioxidant and contain anti-infective properties. – Blackberry has been used medicinally for over 2000 years helping heal bites, gout and digestive issues. Today benefits can be seen with regards to healthy heart and bones. It’s high in antioxidants, boosting immunity and also anti- cancer properties. – Black raspberry is a great source of ellagic acid, a powerful antioxidant that has shown cancer cells to die in lab rats. As of now, it’s a great berry to add to GREENS & BERRIES vitamin dense portfolio. – Acacia herb is an ancient medicinal herb used for everything from aiding in digestion to relieving urinary and respiratory issues. Today acacia has gained popularity as a weight loss aid. – Cherry fruit is high in vitamin C, has some A and few of the B’s. It’s high in potassium but it’s copper and iron content deserve a shout out. – Red raspberry powder is yes, you guessed it….high in vitamin C but has an added edge. Raspberries also supply B9 and vitamin E.
– Pomegranate adds an exotic twist. High again in vitamin C but also containing potassium which helps lower blood pressure. – Bananas are everyone’s potassium go-to. Enough said! – Watermelon is high in magnesium, beta-carotene, vitamin C and potassium. It’s known as a natural diuretic, helping lower blood pressure naturally. – Mango fruit powder is derived from green un-ripe mango fruit. Long favored ingredient in Indian cuisine but connected to improved eyesight, skin, digestion and even dental hygiene. NUTRAPHASE adds more free radical fighting power with marvelous mango. High in vitamin C and surprisingly blood building iron, too. – Peach fruit powder gives a dose of beta carotene courtesy of its sunny hue. Love the extra vitamin C, too. – Papaya fruit powder is rich in vitamin C but its color screams vitamin A. Papaya is most famous for papain, a digestive enzyme, popular in chewable supplement form to support digestion. – Flax seed powder is a healthy fat, working hard, binding to toxins and hormones as it passes throughout the digestion system. Fiber promotes fullness and regularity. Say no to Splenda and other scary sugar sweeteners. NUTRAPHASE contains just a touch of stevia to sweeten. Life is busy but never too busy for a daily scoop of health benefits and energy booster in cereals, shakes and smoothies!